S&EC prepared design plans for the restoration of approximately 650 linear feet of piedmont stream and its associated riparian buffer along an unnamed tributary to Wildcat Branch in south Raleigh, NC. The project also included the restoration of approximately 0.30 acres of riverine wetlands. Project services included evaluation of existing impaired/impacted site conditions, the development of a conceptual restoration plan, and the development of construction documents utilizing collected reference reach data and Rosgen-based natural channel design methodologies for the stream restoration. Services also included U.S. Army Corps of Engineers (USACE) and N.C. Division of Water Quality (DWQ) regulatory coordination and permitting, construction observation and five years of post-construction site monitoring. The project is currently in its second year of monitoring. UT to Wildcat Branch in south Raleigh, NC. 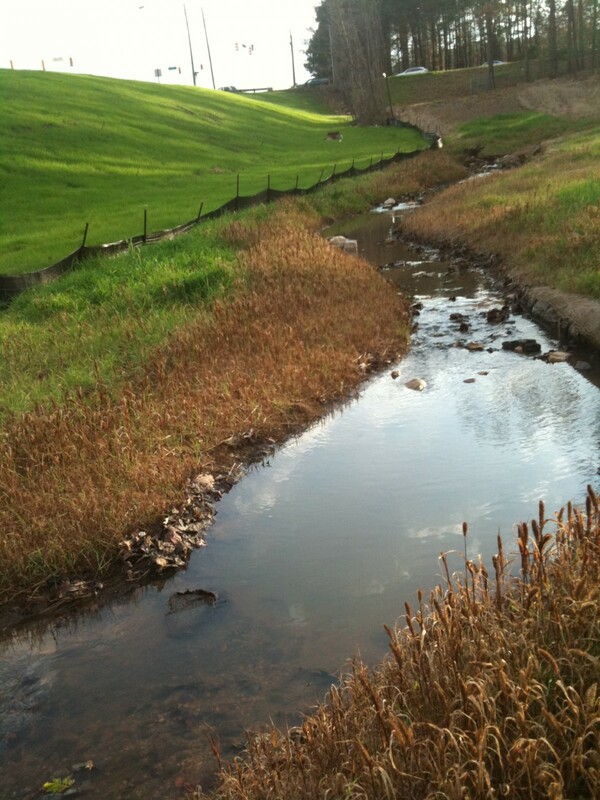 The restored urban stream following initial stabilzation.